It seems fitting that the curtain call — the final post — in this series on the Arts and Books on Vacation should be about THEATRE. Another “up-market” summer drama camp experience is available a little north of New York City, at Stagedoor Manor. Where TADA!’s focus is on musicals, Stagedoor allows kids to choose either Musicals or Drama — or both. Note: Stagedoor Manor is sold out for this summer — but there’s plenty of time to plan for summer of 2016. In the meantime, look for something in YOUR neighborhood! If drama camp is not an option — or even if it is — summer vacation can be enhanced by kids getting together and putting on their own productions. Using the book Break a Leg! The Kids’ Guide to Acting & Stagecraft by Lise Friedman, kids could stage their own drama camp, and their own productions. It covers everything, from stagefright, to using one’s voice properly, to costumes, makeup and lighting, to recovering from mistakes, to theatre and movie lingo — and every topic in between. I so wish I’d had access to books like this when I was a kid. My friends would likely be grateful that I didn’t. I was bossy enough in directing them in my wild flights of dramatic imagination, without having the encouragement of such books. Going to theatrical productions, whether musical or non-musical, is a great way to incorporate theatre into a vacation, as well. In summer there are often family-oriented stage productions, some of them even outdoors. I have attended several performances at Rainbow Stage in Winnipeg over the years, and their musical productions are always well done — and it’s fun to sit in an open air “amphitheatre” style venue and feel the evening breeze as one watches the play. One can have a very different experience in Saskatoon, Saskatchewan, with Shakespeare on the Saskatchewan (the Saskatchewan River, that is). These outdoor performances of two Shakespearean plays each summer stand one’s perceptions of Shakespeare on their heads, with settings that range from modern to alien to medieval. One never knows quite what one will see, but it’s guaranteed to be memorable. In a Canadian blog with a strong focus on the arts and books, I would be remiss if I didn’t mention the annual mainstage production at the Charlottetown Festival of Anne of Green Gables. I have seen this both here in my home city, on one of the occasional tours of the production, as well as at the Charlottetown Festival itself, and I must say there is nothing quite like touring the Anne of Green Gables house/museum in the morning, spending the afternoon on the red sand of Cavendish Beach, rushing back to one’s hotel to shower and wash at least some of that red sand out of one’s hair, and then settle into a seat in Charlottetown’s Confederation Centre of the Arts for an evening of pure delight. Of course, a discussion of theatre on vacation would be incomplete without mentioning London, England and the fabled West End. There are many plays (musical and non-musical) running currently in the West End and in other areas of London and environs that will appeal to families. 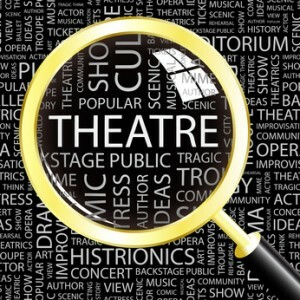 The Official London Theatre Guide website points interested families to many productions that are sure to be enjoyed. One must be careful, however, in reading this guide, as it includes all the pantos that are planned for the coming Christmas season as well — so don’t do as I did, and get excited that Aladdin is playing, unless you’re going to be in London at Christmastime. In writing about London and theatre, I must also mention Shakespeare’s Globe. Of course, the original theatre is long gone, but an American, Samuel Wanamaker, has painstakingly seen to the construction of a replica of that long-ago theatre, and it would be a great place to visit as a family, particularly after reading William Shakespeare & the Globe, written and illustrated by Aliki. This is a fascinating book, divided into Acts, like a play, liberally sprinkled with quotes from a wide range of Shakespeare’s plays, with illustrations and text that bring the plays and the theatres of the time to life. It also tells the story of Sam Wanamaker and his dream of rebuilding the Globe. As I read the book, drinking in every detail, I remembered the model of a similar theatre that I made in my ninth grade Drama class, and found my fingers itching to create such a model in greater detail. That could be a way to involve kids who are more interested in art than in theatre, and show how the arts crisscross and build upon each other. If you’re looking for novels to read to enhance your experience of theatre in the summer, there are a plethora of them available for kids, certainly more than I can list here! Here are just a few, that I’ve mentioned in other posts on this blog: The Wednesday Wars by Gary D. Schmidt, Gracefully Grayson by Ami Polonsky (those two are mentioned in this post); How to Act Like a Kid by Henry Hodges (non-fiction); The Great American Mousical by Julie Andrews Edwards and Emma Walton Hamilton; and Road to London by Barbara Mitchelhill. The Starborn Revue will be dark (a theatre term meaning having a break) for the months of June, July and August. I hope you have a fabulous summer (or winter if you’re in the Southern Hemisphere) and I hope the arts will be part of your vacation. See you back on stage in September! Part One of this series, DANCE, can be found here. Part Two, the VISUAL ARTS, can be found here. Part Three, MUSIC, can be found here.